FATHOM YACHTS are fast expedition yachts with incredible quality, performance, efficiency and accommodations. 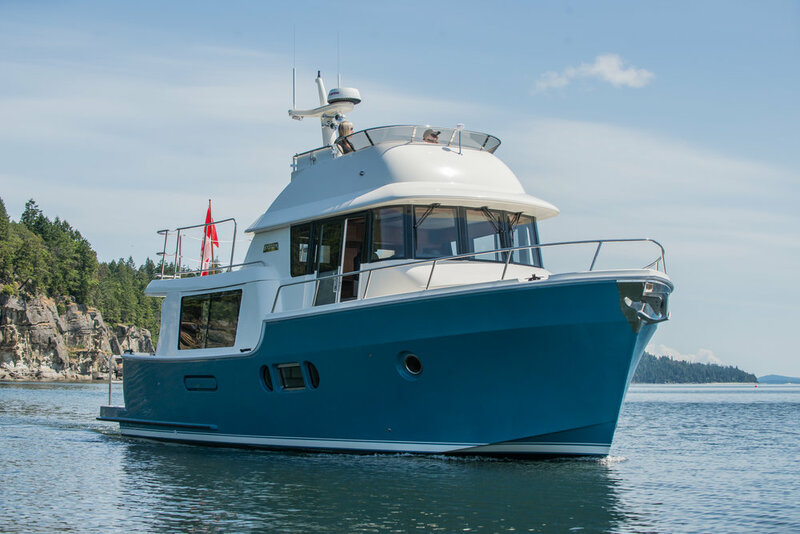 Built in Sooke BC with composite materials and advanced environmentally friendly infusion processes, Fathom Yachts' performance, comfort and value stands out. Read more about our designs, our vacuum infusion process, and the models and layouts we offer. Or contact us to discuss the options of your Fathom! Designed by legendary Naval Architect Greg Marshal, Fathom Yachts stand apart in style and functionality. LOCATED in the Pacific Northwest, a region known for its technology and high quality yacht construction, the founders were able to select the most talented group of builders, engineers and advanced lamination crew in the industry. They teamed up with local Naval Architect Greg Marshall and designed the Fathom 40. After design finalization, Janicki Industries began machining all the male plugs necessary to build the molds for the yacht. The boats are meticulously designed using CAD software resulting in stellar performance, efficiency and ride. CAD also allows better utilization of space and a higher level of fit & finish. Every component and feature was incorporated into the computer design and located for function and ease of repair before the boat was built. Design features like a spacious engine room for easy maintenance, a mid-lazarette with over 100 cubic feet of storage or the folding transom make the Fathom a showpiece. The interior design and layout is spacious, comfortable and perfect for extended cruising or just a weekend away. From the bridge to the engine room, every conceivable access has been meticulously thought out to give the maximum amount of space to the interior ergonomics. By building the yacht initially in 'computer space' we were able to have all the components in place with the correct dimensions so the pieces fit like a glove when assembled. There is no room for human error during construction. Meticulously crafted with a luxurious experience in mind, Fathom brings comfort to your boating life , inside and out. Fathom Yachts are available in 40' and 43' models. Read on for the specs and highlights that sets Fathom Yachts apart. Designed by the legendary naval architect Greg Marshall, the Fathom is a handsome and spacious motoryacht built for those who covet style with speed and fuel efficiency. Fathom utilizes modern CAD, engineering, tooling, and manufacturing techniques that allow unmatched quality, performance, and fuel efficiency. Weight-saving composite materials, a propeller tunnel, and an efficient hull design allow the Fathom to burn significantly less fuel while cruising comfortably from displacement speeds to the high teens with a single electronic diesel. The Fathom's wide beam provides stability and enormous interior space. Two comfortable staterooms, an ensuite head, and spacious salon rival the features of a much larger yacht. The raised pilothouse is distinguished by commanding views from its comfortable helm chair and settee for five. A unique folding transom lowers to expand the aft deck for access and adventure. The styling is modern and distinctive, but maintains a classic profile. The soft yet bold lines set Fathom apart from the typical trawler or workboat style and place it in a class of its own. The Fathom is a beautiful expedition style motoryacht with unique features not found on other yachts. With design features like the distinctive pilothouse, windows in the hull or gracefully curved transom, the Fathom 40 stands out in any marina or at sea. The boats are meticulously designed using CAD software resulting in stellar performance, efficiency and ride. CAD also allows better utilization of space and a higher level of fit & finish. Every component and feature was incorporated into the computer design and located for function and ease of repair before the boat was built. Design features like a spacious engine room for easy maintenance, a mid-lazarette with over 100 cubic feet of storage or the folding transom make the Expedition a showpiece. The interior design and layout is spacious, comfortable and perfect for extended cruising or just a weekend away. Extensive engineering features and use of select materials make the Fathom extremely quiet. Mechanical noise is reduced by the cored hull construction and isolation of the salon & galley sole. The engine noise is dampened by an engine room that is sealed from the living spaces and insulated by a 2" sound barrier. Access to the engine room is through the mid-lazarette which acts as a buffer, keeping the aft deck quiet. The hull has been carefully designed by the naval architect, Greg Marshall with a lifting chine that is not inverted and is quieter while underway or at anchor. The generator is located well aft and is separated from the master stateroom by several compartments and bulkheads. The relatively short propeller shaft reduces vibration compared to longer shafts required by more forward mounted engine installations. The Fathom uses a class 1 propeller set back from the end of the fine keel where the water is less disturbed and can run smooth in clean water. All of these elements combine to make the Fathom 40 a quiet yacht that is comfortable even on long passages. The Fathom was designed to provide the comforts of a home in forty feet while maintaining graceful lines. It is truly amazing that a yacht this size can provide a large salon / galley and accommodates two comfortable staterooms and head. Entering the salon from the aft deck you instantly feel that you are on a larger boat. The space is uniquely inviting and has a settee on the port side, and room for two barrel chairs to starboard. Designed for function and flow, seated guests are at eye level with those creating in the galley. The comfortable settee is perfect for watching the flat screen entertainment system forward. The beautiful hand built woodwork is stunning. Enormous windows allow good visibility around the boat. Forward of the settee is the large “U” shaped galley with corian counters, high-end stainless appliances and abundant storage. Below the galley is a large pantry with 105 cubic feet of storage. A central companionway leads forward from the galley and under the pilothouse to the two staterooms and head. The starboard guest stateroom has a double bed and nearly five feet of in-hull windows. One of the windows is 12" x 24", and as an option can be ordered as opening stainless port. The head entrance door is to port in the companionway enabling easy access from anywhere onboard. Being part of the vacuum infused fiberglass forward cabin module – with a large drain moulded into the cabin sole – one can wash the head and rinse with a hose or shower head. Above the corian topped vanity is another in-hull window available with an optional opening port that makes the head bright and fresh. The head includes a linen cabinet, Tecma fresh water head and a large separate shower. The generous master stateroom features a queen sized berth, large opening stainless ports and ample storage including a 2 door walk-in closet. The raised expedition style pilothouse provides a perfect gathering spot with a settee for five which can be also used as a bunk. Both the leather helm chair and raised settee provide excellent visibility around the boat. At the helm are electronic engine controls and controls for the standard bow and optional stern thrusters. The dash is designed to accommodate an extensive array of the latest navigation equipment. The starboard pilothouse door provides access to the deck. The covered aft deck is pure genius. The unique folding transom lowers to expand the deck for access and adventure. Getting on and off the boat from either a dinghy or dock could not be easier or safer. When the transom is down, the swim step, aft deck and salon are all on one level. The aft deck also features significant storage and a counter with a sink and faucet / shower. The optional Glendenning shore power cord reel makes “plugging in” easy and keeps the cord hidden when not in use. The stairs on the aft deck provide easy access to the boat deck and flybridge. The mid-lazarette with stand-up headroom has plenty of dry storage. This is the perfect place for bikes, dive tanks or fishing gear. An optional weathertight door in the mid-lazarette leads to the engine room. The boat deck above the salon is large enough to hold a good sized inflatable. 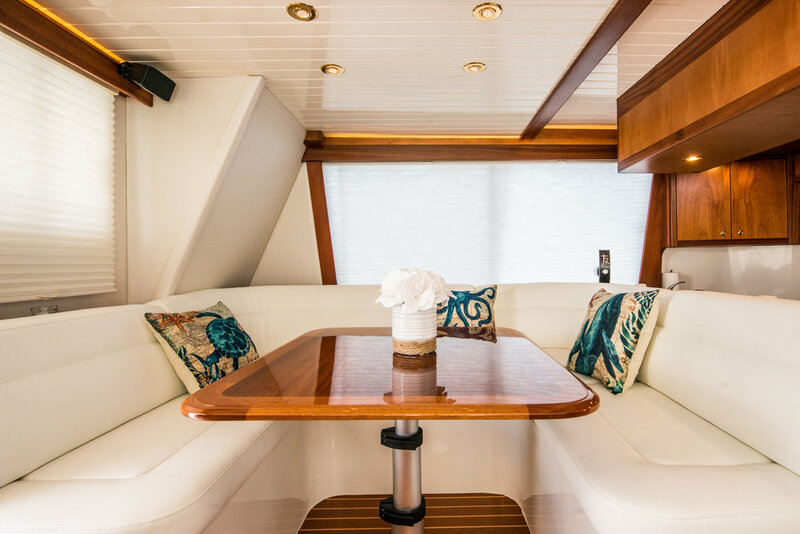 The flybridge features abundant seating, a helm station, and an electronics mast. Wide walk around decks on the foredeck provide a safe area to handle lines or sit and enjoy the view. The stainless anchor windlass is mounted in a well that drains directly overboard, keeping your decks clean. There is a deck hatch for access to the chain locker and storage. The Fathom is a is a proven design utilizing sophisticated tooling and materials. The result is a yacht with superior quality, features, and performance. The use of composite materials and advanced Vacuum Infusion lamination construction reduces weight and increases strength resulting in better efficiency. Infusion lamination is a technique that uses vacuum pressure to draw resin into a laminate. Materials are laid into a mold and a vacuum is applied before resin is introduced. Once a complete vacuum is achieved, resin is literally sucked into the laminate via carefully placed manifold. The part then cures under the higher pressure (14 PSI) resulting in much greater fiber-to-resin ratio. A controlled amount of resin is used resulting in more strength and less weight. Typical hand lay-up construction suffers from excess resin being used and does not have the infusion pressure to help bond the laminate. Excess resin will actually weaken the part. Vinyl ester resin, which is stronger and has greater water resistance than other resins, is utilized in the external hull laminates to eliminate the potential for blisters. Fathom is one of the few builders utilizing infusion lamination to build its hulls, decks and interior modules. Extensive use of composite materials for bulkheads and other surfaces further reduces weight. The hull below the waterline is solid infused fiberglass. The hull sides and deck are cored with synthetic closed-cell foam which provides incredible rigidity, thermal insulation, and sound attenuation. Four major bulkheads divide the hull into compartments and provide strength to the hull and structure above. The engine room features access from the aft deck and space around the engine for easy maintenance. The Expedition is powered by a clean burning full authority common rail diesel. Tankage for 400 gallons of fuel are located outboard of the main engine and are on the center of buoyancy so the trim of the boat will not vary with different amounts of fuel onboard. The bright white acoustic barrier insulation far exceeds the industry norm for keeping the Fathom quiet. The sole of the engine room is molded fiberglass and is easy to keep clean. The quality of the Expedition is apparent throughout the boat and particularly in the engine room. Mechanical and electrical systems rival any yacht on the market. All equipment is chosen for its longevity and quality. The location of various systems and components is carefully planned to provide easy maintenance. Fathom Yachts are designed to exceed ABYC and CE construction guidelines. Safety at sea is paramount and Fathom makes no compromises. Advanced engineering and manufacturing combined with North American quality elevate the Expedition by Fathom to a new level of sophistication and safety in its class.